The luxury accommodations at the Hollywood Roosevelt combine contemporary aspects, upscale amenities, and vintage Hollywood glamour. Each of the 300 guestrooms and suites feature 400-thread count linens; flat-screen televisions with premium channels; a fully stocked minibar; WiFi; 24-hour in-room dining; and complimentary newspapers upon request. 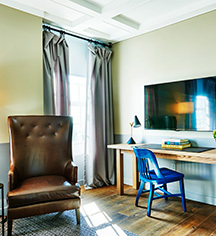 The hotel's Tower rooms, designed by Yabu Pushelberg, emphasizes the hotel's Spanish Colonial roots with Spanish-inspired tapestries, linens, exquisite leathers, and color palette. The furnishings, including a desk and a four-poster bed, provide a regal and cozy atmosphere. The bath, which is canvased in marble with black metal accents, features a geometric tile pattern on the floor— a modern and cleaner interpretation of traditional Spanish tiling. 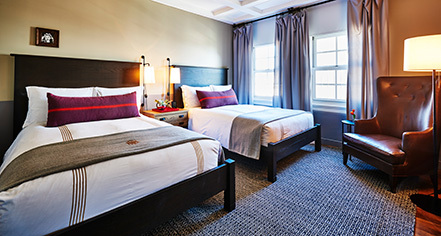 The Tower suites at the Roosevelt also focus on the hotel's Spanish Colonial roots, with beautiful leather couches, hardwood floors, and wooden panel doors that separate the bedrooms from the living space. The Marilyn Suite and Gable & Lombard Penthouse Suite are remarkably unique spaces, designed to emulate the Hollywood charm and glamour of a bygone era. The Cabana rooms were originally built in the 1950s and the exterior has been preserved to maintain the retro fifties façade. The Cabana room interiors have been refurbished and modernized to accentuate the ambiance of a California boutique hotel. Located just footsteps from the historic pool, the Cabana rooms feature mid-century furniture and a simple palette of natural white oak and charcoal wool, juxtaposed against bronze mirrors and ebony floors. Explore the accommodation types available in the Tower and the Cabanas.